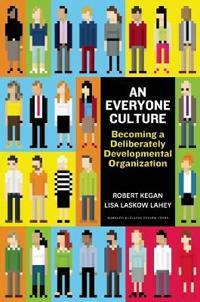 Robert Kegan and Lisa Laskow Lahey just released the book An Everyone Culture – Becoming a Deliberatively Developmental Organization. Here are some quick thoughts on it along with some background. In 1982 Kegan wrote The evolving self where he took departure from Jean Piaget’s stage theory and introduced his subject-object theory, SOT, on how we make meaning in increasingly complex ways (this article offers some background on Kegans work). According to the theory a measurement instrument, subject object interview, was created by Lisa Lahey, Kegan and colleagues. In 1994, Kegan released In Over Our Heads – the Mental Demands of Modern Life, where he elaborated and applied the SOT in different dimensions of our lives, such as parenting, partnering, school, work life etc. Here Kegan connects the different orders of consciousness or meaning-making with the demands that modern life exposes us to, and argues that a significant proportion of the population does not live up to this. These two books have since been very influential in the field of adult development, rightfully so. In 2009 Kegan wrote Immunity to Change, ITC, together with Lisa Laskow Lahey, where they introduce the Immunity to change process. ITC builds on the insights from the SOT and the dynamics of stage transition where meaning-making can be seen as frames of reference based on certain assumptions that are invisible or taken for granted by the person. Moving from one order of consciousness to the next one means being able to see these assumptions and thus making them an object. So, you go from being the frames of reference and identifying with them as a subject, to having them as an object. The ITC process doesn’t necessarily induce transitions of orders of consciousness of the individual that performs it, but can help in getting rid of some blockings and unproductive assumptions on the way. The ITC process was also introduced in a MOOC and several instructors have been trained in facilitating it. Thus, Kegan can be said to have moved from being a researcher to dealing more with applying the insights with the process tool, foremost in organizational settings and to a mainstream audience. In order to introduce the main scope of the book, imagine that you are interested in personal development and apply the ITC process on yourself. You succeed, make progress and then go back to your organization where you soon find yourself reverting back to your old habits. This can also be observed in therapy when you back in your social environment tend to go back to your old behavior. Therefore it can be a point in involving family and peers so they can accept and support the new version of you, so to speak, instead of resisting the change. But what would it look like if an entire organization has a culture where it is not only accepted for you to grow and change, but even expected of you to develop as a person and expected of you to consciously take measures to make that happen, e.g. by using the ITC process? And not only in the work role but as a whole human being. An Everyone Culture introduces the notion of a deliberately developmental organization, a DDO, where the company culture is based on that exact assumption. A central aspect that Kegan and Lahey is putting forth is vulnerability, and refer to Brené Brown’s work. In typical work settings we are doing two jobs, they argue, one of doing what we are supposed to do at work and then one of covering up our weaknesses. Vulnerability in this context means being open and transparent about your limitations, failures and weaknesses. If not, you won’t be able to learn from your mistakes. And not only do you want to learn from them, but also see them as a source of personal development. In relation to this, leadership has as a main function to ensure a holding environment so that people that expose their weak sides won’t get a lower salary or get backstabbed, the fear of which is probably the main reason for us not to be more vulnerable at work or in any context. This focus on failures and mistakes may sound counter intuitive, we are often told that in groups we should primarily focus on and build on peoples’ strengths and positive aspects, while focusing on weaknesses can be a way of putting the employees in place and exert power over them. Kegan and Lahey argue, from the three companies they have studied, that no one there is safe from exposing their own failures and that anyone can provide negative feedback to anyone. Thus, the leaders need to go first and set examples with exposing their own “backhands”. This way, the company culture and view on personal development involves everyone in the organization, not only handpicked talents. I find this interesting and a useful discussion. Being able to be vulnerable and expose your limitations, I believe is a very important factor of becoming a learning organization. If everyone covers up their mistakes, no one will learn anything. And I think the organizational culture sets the bar for how much you dare to expose yourself. But in DDO:s it’s not only being able to expose your weak sides, you are obliged to do something about them and develop. Therefore the third dimension of a DDO, where the two first are the individual aspect of developmental aspiration and the communal holding aspect, is developmental practices, i.e. a set of tools and methods that will help the employee, the group as well as the organization to develop. It’s great that they are explicit about this limitation, and given my introduction on Kegan’s work, this focus is understandable. However, and here follows my main criticism, when I started reading the book I expected to find some further connections to the structural dimension. For instance, I would want to know if there is any correspondence between a DDO and a Teal organization in Laloux’ terms. Or correspondence with organizational structures described by Sociocracy or Holacracy, or the structural aspect of Spiral dynamics. One common denominator is the notion of “evolutionary purpose” and “bringing the whole person to work” described by Laloux. But this connection is not discussed or referred to by Kegan and Lahey at all. It seems that they have focused only on applying their own research and not so much reviewed others. The research around ITC is recent, but the adult developmental aspect they refer to is 20 years old. What are the connections between teal/yellow organizations, the level or complexity of the organizational culture, and the meaning-making and complex abilities of the employees? This book can offer some pieces of this puzzle, but not an overview. This is a blind spot in Kegan and Lahey’s book, if the organization demands that I develop my whole being, then correspondingly, I would expect to be able to influence the organizations structural logic as well as purpose. And regarding the organization’s purpose. Here the three organizations claim that they have the two main goals of profit and employee growth, and that they are not mutually exclusive, but rather reinforcing. Being a DDO and investing so much effort in the employees to grow is not a means to the end of making more money, but an end in itself, they argue. This sounds great, but I would be even more appealed to these organizations if they did something of relevance for the world or if CSR or sustainability were central concerns. These aspects are however absent from the discussion. The three organizations chosen could be in any industry, which is intended since it demonstrates a point that it’s possible for any company to be a DDO. Ok so, but Bridgewater – a hedge fund?!? Concluding, nevertheless I find the book interesting and useful for me. As Kegan, my interest is shifting from the interior individual quadrant to the collective ones. Hopefully, the next book by him and his colleagues will make further progress into the structural quadrant, and relating with more recent developmental research within the organizational realm. I believe that’s where their growing edge lies. Interesting. I recently re-read Laloux’s book and presented it to my colleagues at work. We are implementing some of the thinking and practices from the book and another framework called PROSOCIAL in our daily work-life. Now I’m going to read An everyone culture to see if we can find some more… we have actually already done the Immunity to change process a while back. I was of course also thinking of the realtionship between Reinventing and Everyone culture, I wonder why it isn’t even mentioned since there are obvious similarities as you point out, and Kegan and the others are well aware of it. Kegan is even quoted praising Laloux’s book. My conspiratory tentacles says that it may have something to do with Kegan and colleagues, like the organizations they’ve studied, still being in an orange mode of operating. Their book is heavily tied to the services they are providing (selling). Maybe they see Reinventing and Teal as competition somehow. If this is the case it is explained and transcended in Laloux’s model but not Kegan’s. Thanks for sharing! Inspiring to hear that you are experimenting with this at work. It’s in the health care sector, yes?! I will check out Prosocial. I’m ok with Kegan ommitting Laloux and the structural aspects to delimitate his work since he is explicit about it. I also think he don’t want to exclude the “orange companies” that of course is and will continue to be the major part of the market. It can also be a point in introducing one developmental aspect at the time. But he should at least mention them.